We’re celebrating Quinn’s birthday this week, so I have special occasion desserts on my mind. A dessert doesn’t have to be complicated to be worthy of a celebration. 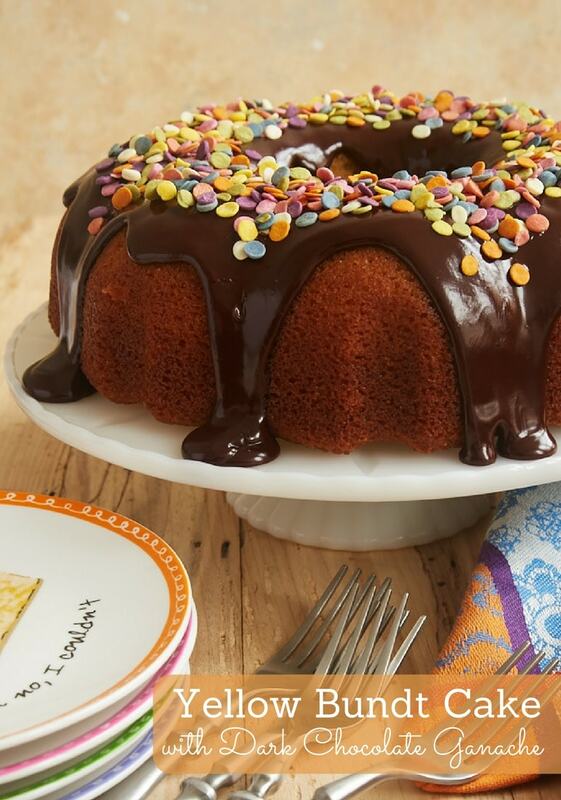 This beautiful, happy Yellow Bundt Cake is certainly proof of that. 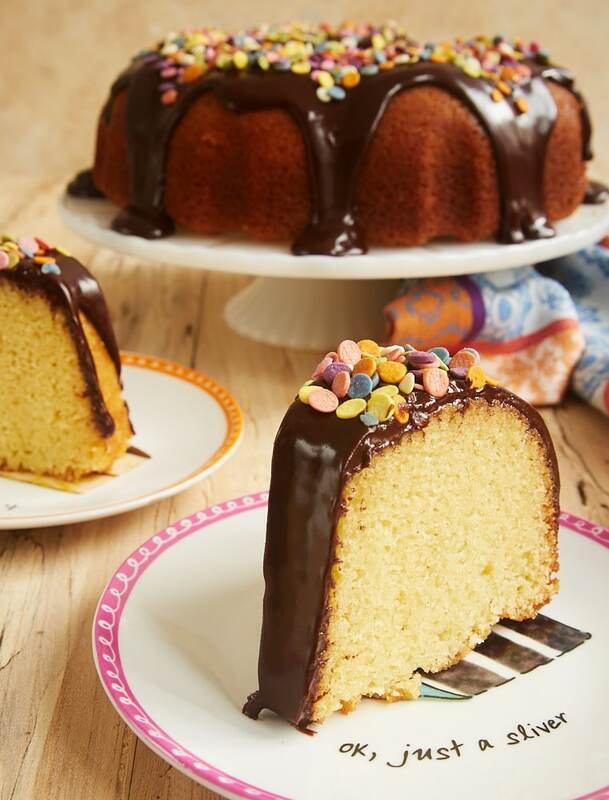 The cake itself is a simple yellow Bundt cake that’s perfectly sweet with a wonderful texture. It’s sturdy yet soft and moist. Topping it off is an embarrassingly easy dark chocolate ganache. The whole package is a combination of straightforward flavors that’s sure to be a crowd pleaser. I’m not really the type of baker that makes overly decorated desserts. I think they’re beautiful, but they’re just not my thing. 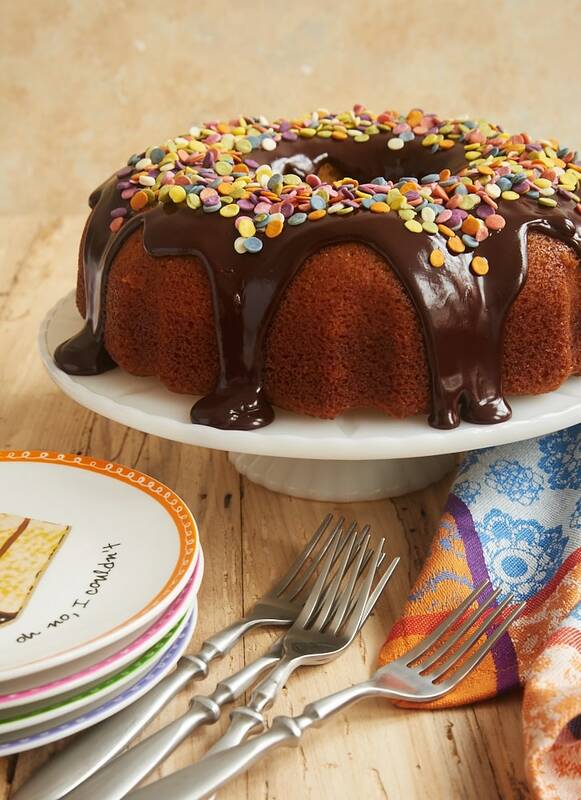 Luckily, all the accessorizing this cake needs is a generous application of sprinkles! I’m absolutely smitten with the sprinkles on this cake. I just love those colors! The fact that they’re not colored with chemicals is pretty great, too. 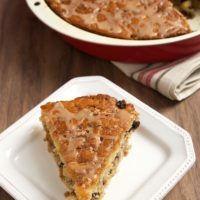 As an alternative to sprinkles, try topping this cake with toasted nuts, coconut, toffee bits, or whatever else you like. Or leave it unadorned for a simpler presentation. As is the usual case with ganache, this one is beyond simple to make. Just chop some chocolate, heat some cream, and combine. I like to add just a bit of corn syrup to make the ganache shiny and sturdy. If you prefer, you can omit it. This is just the kind of cake to serve a crowd. The flavors are pretty much guaranteed to be a hit. Plus, it’s such a happy cake, isn’t it? 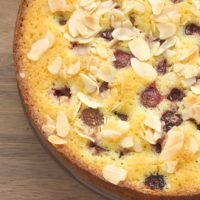 It’s certainly one of my go-to cakes for a simple celebration. 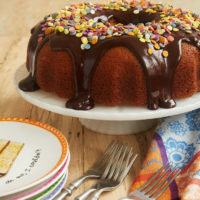 Yellow Bundt Cake with Dark Chocolate Ganache is one of my favorite celebration cakes, thanks to its crowd-pleasing flavors and ease of preparation. Just add sprinkles! Preheat oven to 350°F. Generously grease a 10- or 12-cup Bundt pan. 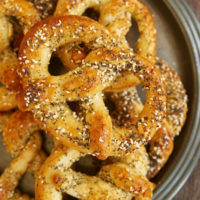 Whisk together the flour, salt, baking powder, and baking soda. Set aside. Reduce mixer speed to low. Add the flour in three portions, alternating with two portions of milk, mixing just until combined. Transfer the batter to the prepared pan, and spread evenly. Bake 50 to 60 minutes, or until a pick inserted into the center comes out clean. Cool the cake in the pan for 20 minutes. Then, flip the cake onto a serving plate to continue cooling. Place the chopped chocolate and corn syrup in a medium bowl. Heat the cream in a small saucepan over medium heat, stirring occasionally, just until the cream begins to bubble around the edges. Pour the cream over the chocolate. Let stand for 5 minutes. Then whisk until smooth. Pour the ganache over the cooled cake. Garnish with sprinkles. *The corn syrup will give the ganache a beautiful shine and make it a bit sturdier. You can omit it if you prefer not to use it. Looks so yummy! Be making this one and will report back on the outcome. Thank you. Always look forward to your recipes in my inbox! Happy Spring…oh…love the sprinkles too and happy Birthday to your Quinn. I know I will find an excuse to bake this one. I LOVE your dessert plates! So adorable. Thanks, Karen! I hope you enjoy the cake! 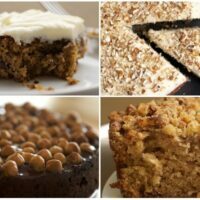 Your recipes are the BEST!! 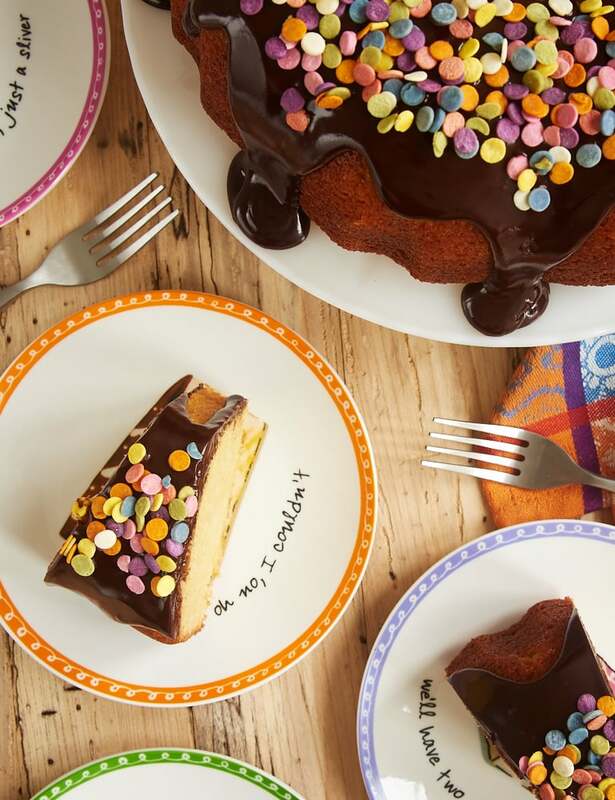 Where can I purchase those darling dessert plates? Thank you so much, Cherrye! I don’t think those plates are currently available. I found them on eBay, if I remember correctly. They’re called Dessert Excuses, and they’re made by Boston Warehouse. 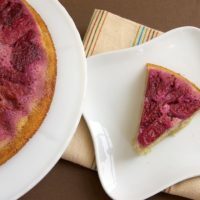 This looks really good, always looking for a good yellow cake recipe. Plus ganache is never a bad idea! Excited to try this, thanks! Wow!!! that looks so amazing. I am gonna add this to my menu. Thanks for such an amazing recipe. Looks very delicious, nicely decorated and amazing recipe. Good job… Keep it up. Hi, Michelle. 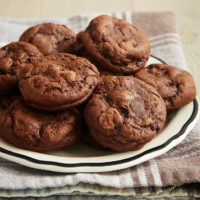 If you didn’t change anything about the recipe, then you might have too much flour. Look at my tips for measuring flour if you need a refresher. I’m glad you liked it, Leslie! You can sift it if you like, but it’s not necessary. Unless you measure your flour by weight, be sure to sift after you’ve measured it.